Volleyball passing on the beach can be difficult and even seem awkward at times. If you aren't used to moving around in the sand, it can be difficult to get in a comfortable position to pass. Learning to pass is the most important skill on the beach because ball control is so important when playing sand volleyball. When you make a good pass, you've given your partner an easy ball to set. This is very important because on the beach, it's can be very hard to move around in the sand and prepare to set. Also, when a hitter gets a good set on the beach, the kill percentage is much higher than indoor because there are fewer player's to stop your attack. For example, when you hit in doubles, you likely have one blocker up at the net, and one defender back playing defense. 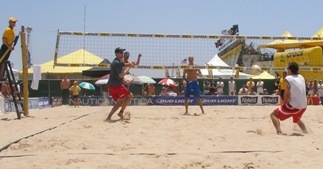 Rallies tend to be much shorter on the beach when player's get a good set to spike. A lot of times partners are small and they don't want to block. So there are situations when you'll play teams that don't block at all. It's real important to get a good set when there's no block up because with no one blocking, it will make it much easier to put the ball away for a kill. If you're new to the beach, consider the following volleyball tips for playing defense on the beach. 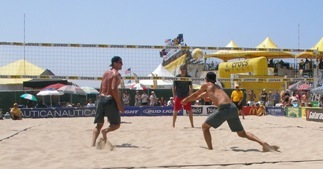 You'll likely noticed that many beach volleyball veterans have unusual volleyball passing techniques. example, you might have seen a beach player play a ball overhead with palms together. This is called a tomahawk. The tomahawk is a volleyball passing method for a ball that would typically be out of reach over your head. 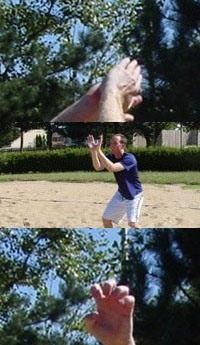 Since open-hand attacking with your fingers is illegal in doubles, beach players develop techniques for playing the ball with their knuckles to poke the ball. One handed volleyball passing techniques can important because you often find yourself in positions where you need to reach tight to the net and play the ball in a way to just keep it in play. The face dig technique is also popular on the beach. The face dig can be an important skill for digging as well as protecting your face for when you're caught having to play defense with no one blocking at the net. You have to be prepared both physically and mentally to pass in the sand. Volleyball passing is the skill that calls for the greatest attention because of how hard it is to get in position to volleyball pass. Also, there's a constant mental war going on between the server and passer. If you're up against a great server, great volleyball passing can neutralize this situation. Passing on the beach can be a real tough task because of such elements as deep sand, wind, and the sun. Many player's wear sunglasses because during the game, you look up and if you don't have sunglasses, you likely will get blinded by the sun. Wearing sunglasses while playing volleyball can be uncomfortable when you play in them for the first time, but most player's soon get used to wearing them. Sunglasses are also helpful for keeping sand out of your eyes. This is especially important if you wear contacts. If it's windy and the wind is blowing from one end of the court to the other, the side that's easiest to play on is the side with the wind in your face. This is especially true for passing. It's much easier to pass balls that are moving with the wind rather than against the wind. In the wind, it's best to keep passes low because the higher the pass, the more the wind can move the ball around which makes it more difficult to set. On the beach, the passing target area is different than indoor sixes. In doubles, you want to pass the ball straight in front of you. This way, it's much easier for your partner to know where to go to get in position to set. Also, it's much easier to set a shorter distance (the setter is setting more straight up and not out across the court like an indoor set). There's only one hitter in doubles, so you aren't really trying to fool anyone with the set. This is why it's a good strategy to pass the ball to the same side of the court as you want to hit on. It's much easier for the setter to set on the same side of the court, rather than having to set all the way across the court like an indoor set to the outside hitter. Basically, if you are on the left side, pass the ball straight ahead and a little to the right. Most doubles player's like to be set about the same distance from where the ball was passed. For example, after you pass the ball, you can expect the set to be about 3 feet out from where it's being set from. This helps with consistently knowing where to approach to after each time you pass. Generally, in serve receive, the crosscourt player takes the ball that's served to the middle of the court. One reason why this is the case is because the other player has to prepare for the serve down the line. The serve down the line comes much faster because the distance the ball travels is shorter. So if the serve is directly in front of you, hug the line a little. Volleyball passing success on the beach calls for constant communication between partners. The importance of good communication skills can't be stressed enough. Discuss before each serve who is taking the middle ball.